I have what would be best described as a knock-off trail-a-bike with a cheap hitch that I am wanting to know if there is a hitch I can use as a replacement. The bike is a Alley Cat Shadow 2 by Advent. I will try to get a pic up soon of the existing hitch. Any ideas are welcome to assist me in refitting a replacement updated hitch to what I have. 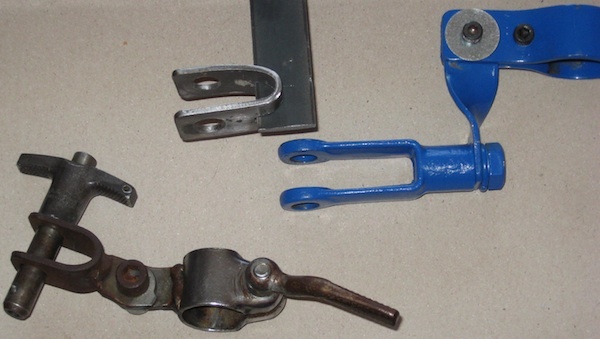 Retrofitting one brand of bike trailer hitch to another can be quite a tricky and risky thing. These risks are even higher when it comes to trailer-cycles and their coupling system. We’ve published some general recommendations and thoughts about these risks for bike trailers at the Bike Trailer Blog. These warnings should be taken even more seriously for trailer-cycles. Do you have the part that would connect a Trek tag along bike to the adult bike post? We do not have the part for Trek tag alongs. As mentioned use caution if you are thinking of retrofitting parts from other brands of Trailer-Cycles. Is there a smart guy/gal out there who understands the geoemtry, required motions and function of the trail-a-bike hitches? On a basic level, a Trail-A-Bike hitch must function the same as any single-wheel bike trailer. It must rotate in two directions, up-and-down and side-to-side. The up-and-down rotation, allows the bike to do a wheelie or go over a bump. The side-to-side rotation allow for the bike to turn and the trailer rotate behind through the turn. A Trail-A-Bike Hitch generally has these two rotation points close to the point that it attaches to the seatpost of the bike. Have a look at the following blog post on some DIY Seatpost hitches that illustrate a few different approaches to this. I have the Advent Alleycat II trailer bike and I am missing its Hitch. I can not find any data on the original hitch or where can I get it. Never the less from a long research I made on-line it looks like my best chances are to try the Weehoo iGo Trailer Hitch instead. I would like to ask if you can send me the Weehoo hitch dimensions (specifically the width of the trailer side link). Attached is an image with the dimensions of the 2012 Weehoo hitch. Please be aware that any use of this item with out the intended trailer is not supported by us or the manufacturer. By using this item on any other trailer other than the Weehoo iGo you are voiding the warranty of all items involved. If you have not read the above posts on this thread I would suggest doing so.